Hot and cold running My Little Pony hit iTunes today (with Android coming soon). Hot because the obvious love for fans of the show, and cold for the city-building gameplay that I likely wouldn't bother with if not for the prevailing ponitude of it all. 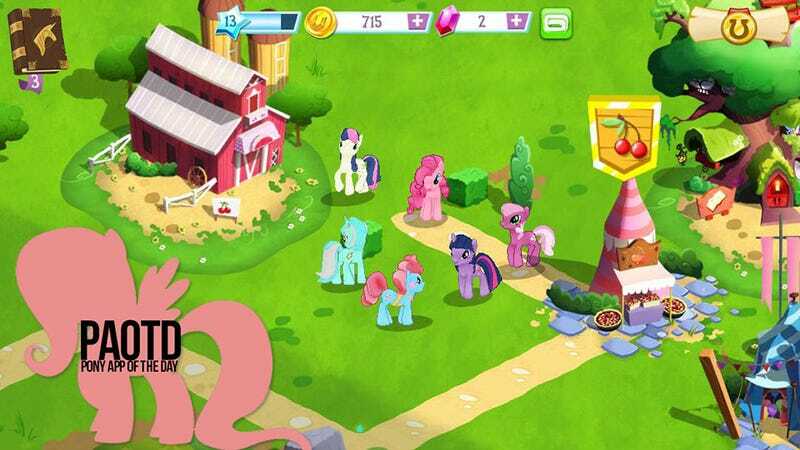 I've been excited about the My Little Pony mobile game from Gameloft since before it was even a going concern (*slips on thick black glasses*). A chance to explore the world of the cartoon that captured the imagination and wallets of people all over my living room? Where do I sign up? As it turns out, I had to sign up with Gameloft PR. They come highly recommended. When I learned this would be a city-builder type of game my lips pursed and eyes narrowed. I'm not averse to a good city-builder, but I was hoping for... hell, I don't know what I was hoping for. Batman: Arkham Asylum? Sure, I'll take that. I still maintained vibrating-through-walls levels up until yesterday, when the final build slipped inside my iPhone and did rude things with it. And now that I played it? Hmm. On one hoof, Gameloft's crack development team is obviously in tune with the adult side of pony fandom. Fan-favorite characters like Jeff Letrotski and Jesus Pezuna (The Big Lebowski parody characters) and DJ Pon-3 are available to purchase or win in the game. In the unpurchased areas dominated by Nightmare Moon, the evil pony princess from the first arc of the animated series, a cardboard box with eye holes randomly wanders. Tap it, and Derpy Hooves pops out, showering the player with coins. They know what Bronies and Pegasisters crave and they deliver, at a price. The most expensive pony, Princess Celestia, costs the real-money equivalent of some $70—that's insane. On the other hoof, the gameplay is pretty bland. Players build houses and business to earn money, which is used to purchase more houses, businesses, ponies and land. Each pony added to the general population has a star ranking. Participating in two simple mini-games helps raise levels, which allows ponies to take on bigger jobs that pay better money. It's slow going and simplistic, a side effect of also being a game a small child might play for some reason. I know what you're thinking: Fahey, ponies have four hooves. Which two are you talking about? Why, the important ones, of course. My Little Pony is a free game, supported by fans desperate to add iconic characters to their collection. I this were an app I had to pay for I might not, but a free portal to Ponyville is hard to pass up. Who am I kidding, I would have paid $10 for this. I was just role-playing a normal person up there.